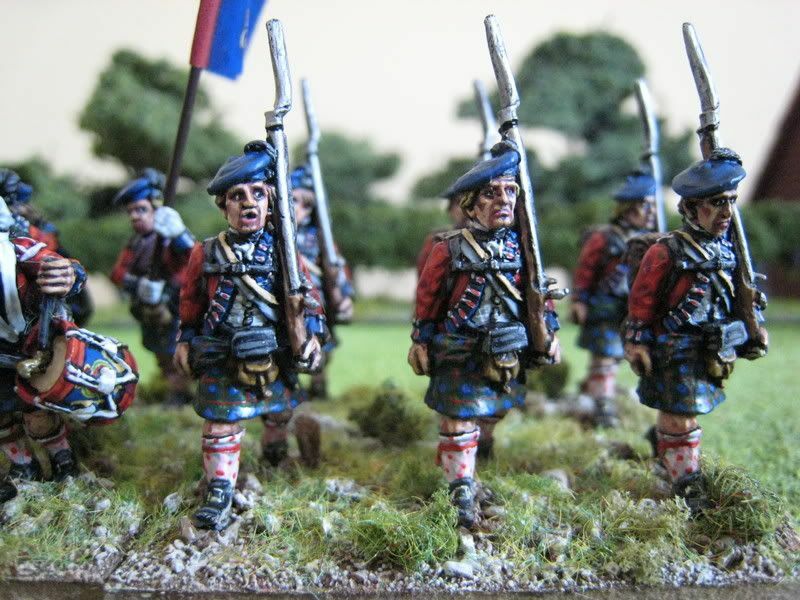 84th Foot, "Royal Highland Emigrants"
This is the second unit in my first pair of Southern Continental/Militia units. 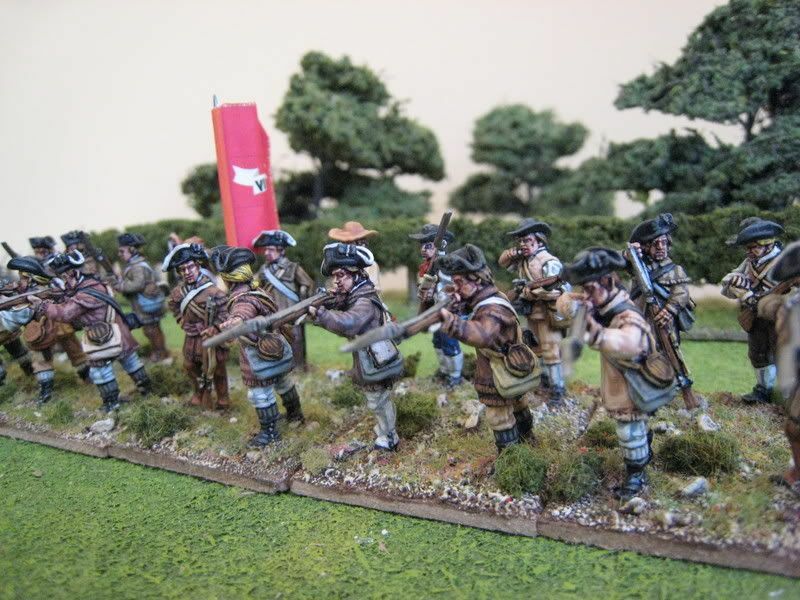 Whilst the 8th Virginia was designed as a regular army unit, these chaps are very much militia. 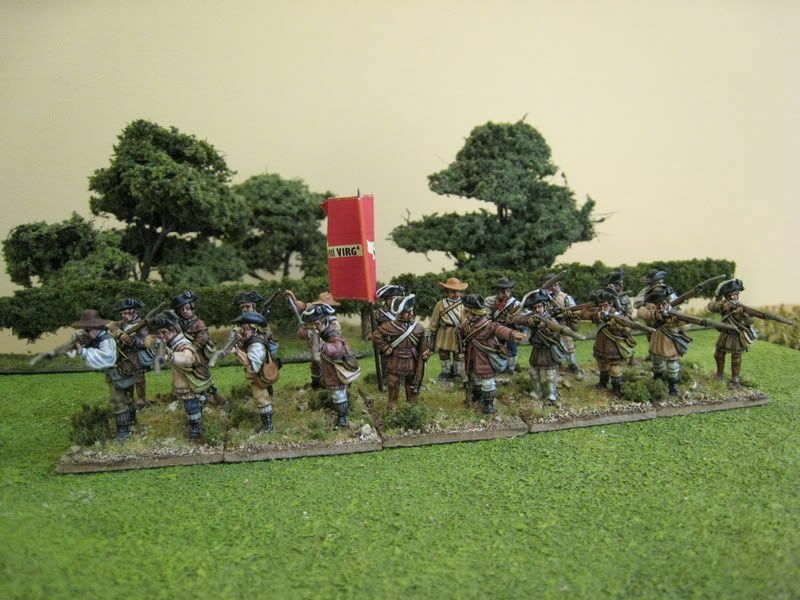 The figures are largely Perry, but with a couple of Foundry minutemen and "pirate" negroes thrown in. The flag identifies the unit as being from South Carolina. 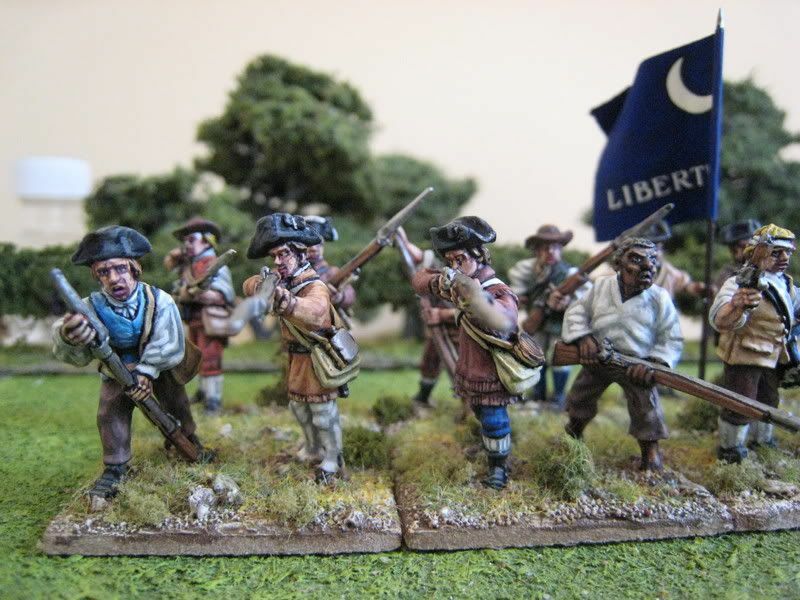 With a change of command stand or flag, these figures would do perfectly well as loyalist militia. 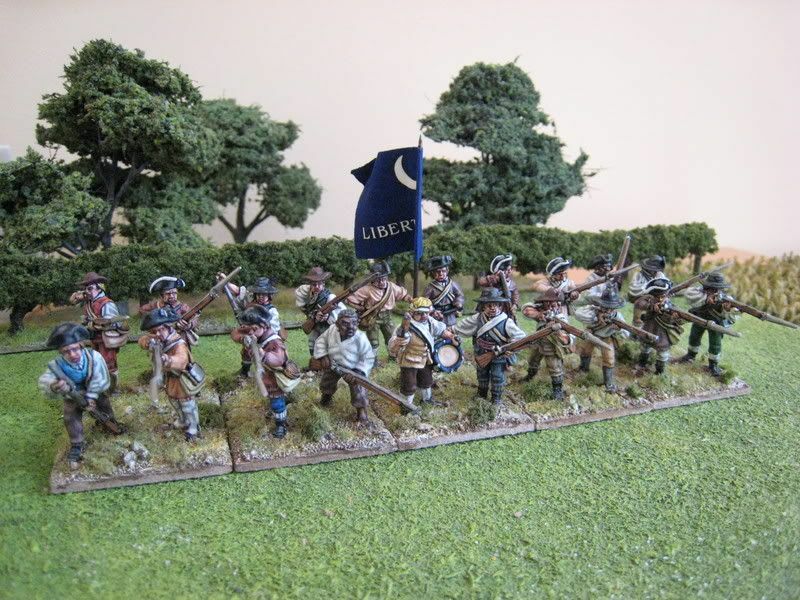 And, of course, the figures from the 8th Virginia can be combined with these ones to form a larger militia regiment for battles in the "British Grenadier!" scenario book are played out at a 1:10 ratio, such as Camden. For some reason I found the faces of some of the firing figures harder to do than usual (as can be seen from the close-ups). Sometimes it just doesn't seem to work, no matter how hard you try. I painted the command figures whilst listening to the recent London mayoral election results, which might explain why the drummer looks like Boris Johnson (or Gordon Ramsay - take your pick!). This is probably one of the last firing line units I will be doing for the American. 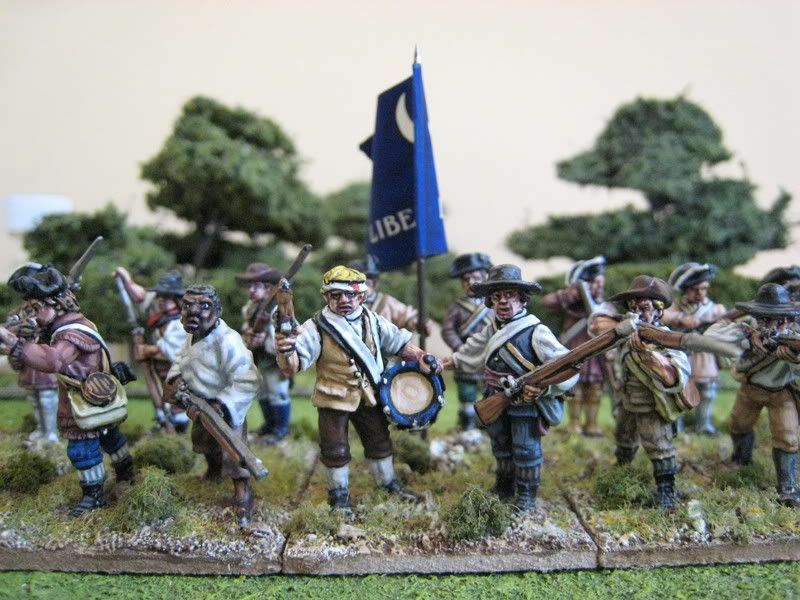 I think I have the figures for one or two more, but most of my American regiments are "firing line" posed and I will be concentrating on "advancing" figures going forward. When building units for particular battles I look at what happened historically and pose the units accordingly - hence why my Americans are largely firing line and Brits largely advancing/charging, as most battles of the war involved British assaults on American positions. 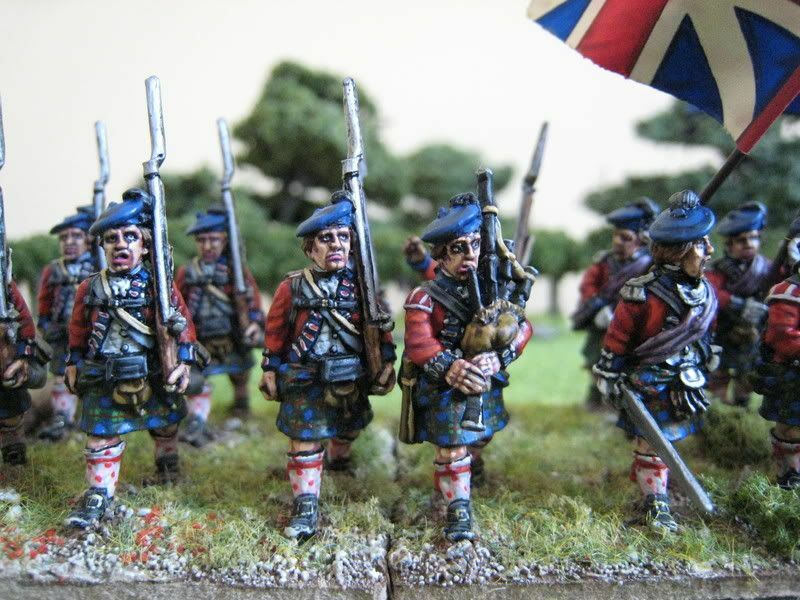 The Saratoga battles are the obvious exception to this, but the second "British Grenadier!" scenario book has some more obscure engagements, like Savannah and Eutaw, which involve American attacks. So it's units for those scenarios that I am going to concentrate on over the next few months. 20 figures. Painted April/May 2008. Flag from GMB. I had not intended to paint up units specifically for the Southern theatre until early next year, but have found myself doing so now pretty much by accident. 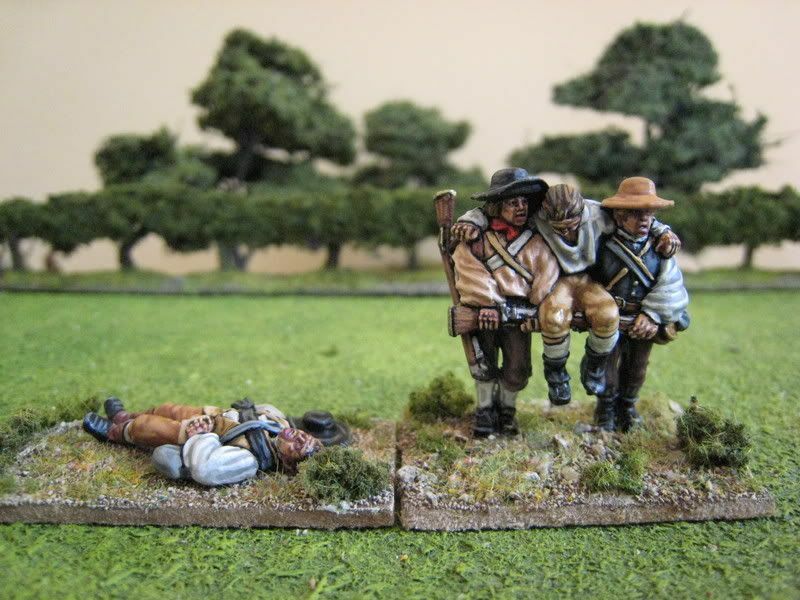 I think Henry Hyde is partly responsible as thanks to him I had a stab at recreating Guilford Courthouse (the photos can be seen in issue 11 of "Battlegames" magazine) and realised the figures I had were not really suitable. 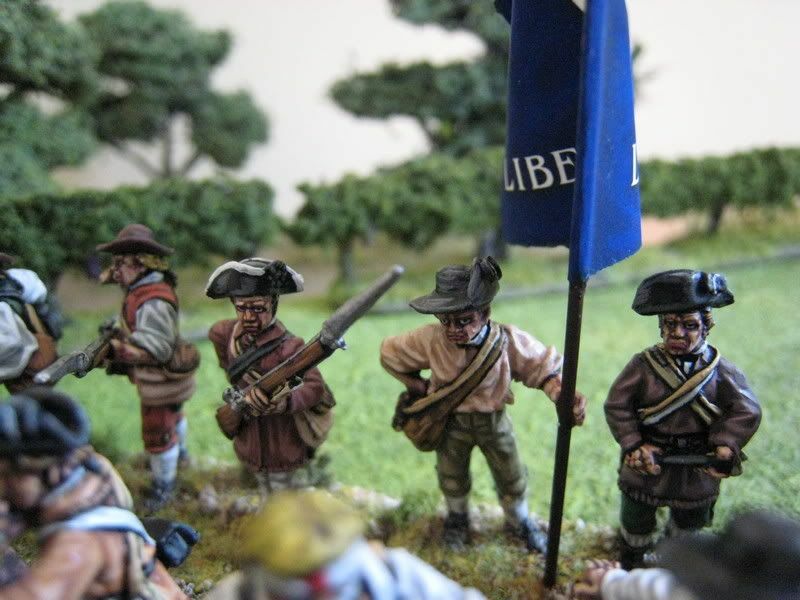 That experience, my visit in March to South Carolina and then buying a load of the new Perry Southern militia figures at Salute have now all combined to send me into 1780s overload. After Washington's dragoons and the 84th Foot I have been working away at a series of 4-5 American units that can be used either for militia or Continental service but specifically for the Southern campaigns - all shirt-sleeves and hunting shirts. I find that the most effective way of painted figures in hunting shirts is to paint a batch in the same colour and allocate them between 2 or 3 regiments. That way you preserve the economy of painting several figures in the same uniforms whilst ensuring that each unit has a good spread of different shades of browns and beiges. This is the first of two regiments I have finished, both of which use largely the same figures (although the second has a couple of surprises). 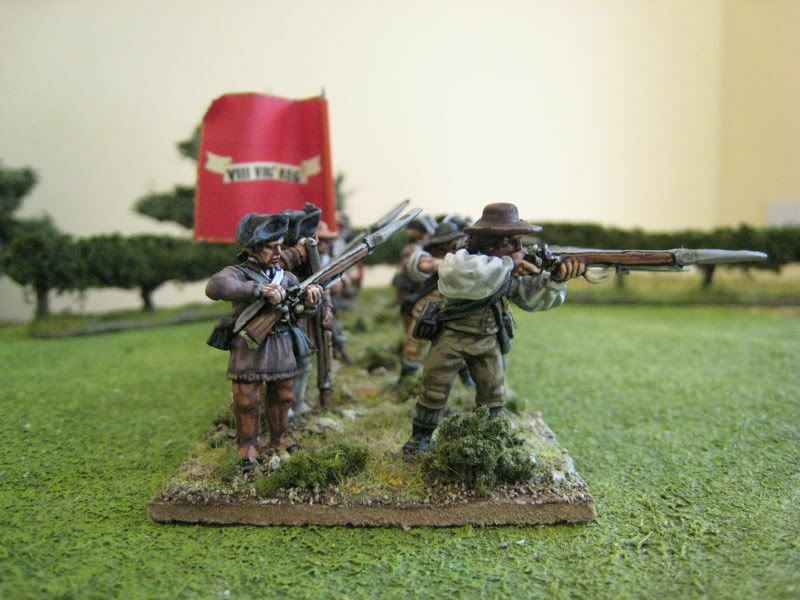 I sat down with the "British Grenadier" scenario books and worked out how many militia and regular units are required for the various Southern battles. 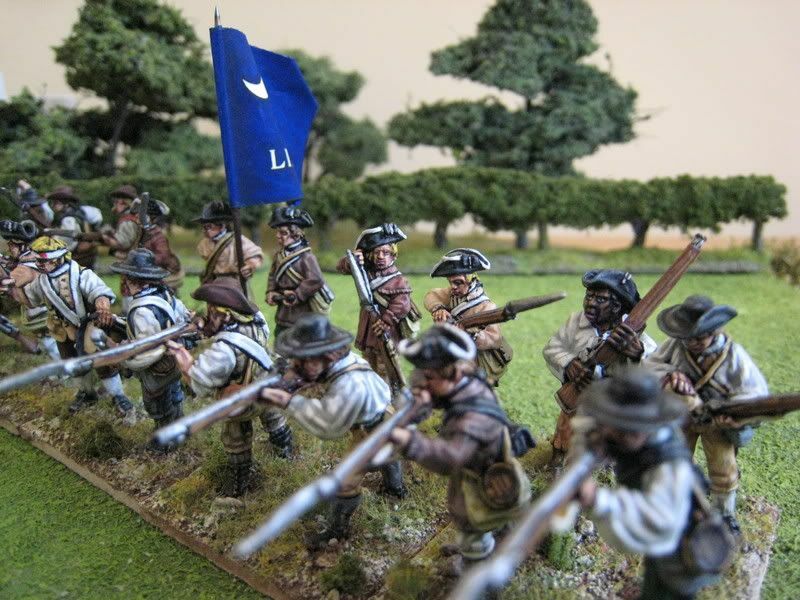 So, for example, the hypothetical "Gloucester Point" scenario in Book 2 requires four 20-figure units of Virginia militia, whilst Cowpens needs three 20-figure units, one each from North Carolina, South Carolina and Virginia. A similar number of figures are required for Eutaw Springs. So I decided to paint these regiments in pairs, with each pair containing one unit that was more clearly "Continental" and one that was more "militia" in bearing and appearance. The general idea is that given what people were likely to have worn in the South these troops could double-up as required. They will also pass muster for "hot weather" engagements in the North, like Monmouth. This is the more "Continental" of the first pair, and I designated it the 8th Virginia only because I bought the regiment's flag a while ago and have been meaning to use it. 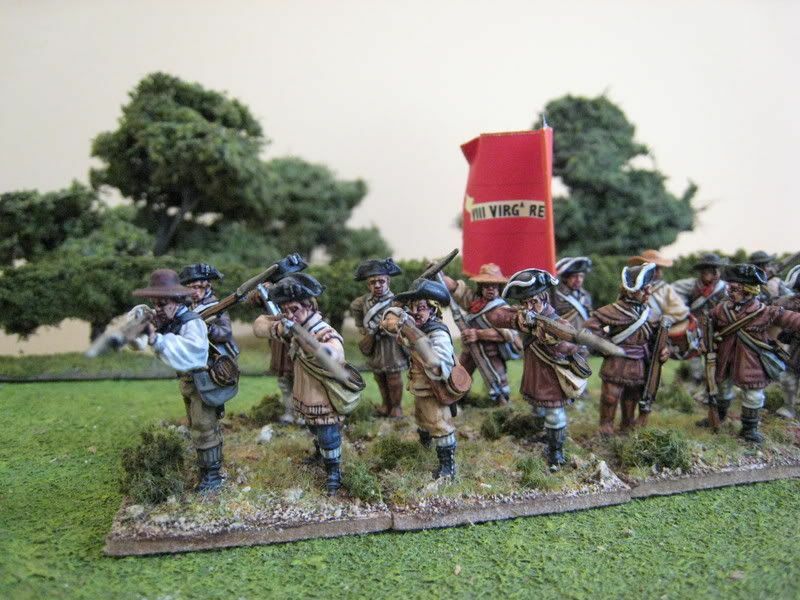 The unit is quite similar to my 11th Virginia from a couple of years back (see here), with the latter's riflemen figures being replaced by a pack of Southern militia. The drummer is from the new Southern militia standing command pack and is one of those rare examples of a "Perry nod": the drum-belt can clearly be seen on the front of the figure, but it ends at the neck and has no reverse. I think I exhausted every combination of brown and cream in the Foundry paint system on these figures. 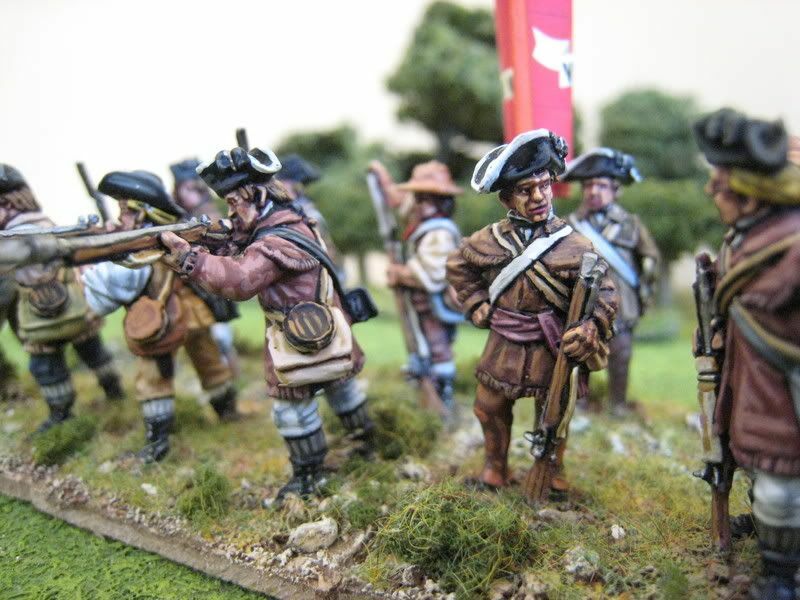 I noticed that the "Peat Brown" palette acquires a vaguely purple hue when you add white to the "c" colour - there was a Maryland regiment that according to Mollo sported purple hunting shirts and it occurred to me that these "Peat Brown" colours would be very suitable for that regiment. 20 figures. Painted April/May 2008. Flag by "Flags for the Lads". Which brings me to the "flowers". This scatter was sent to me by Murray Bridge terrain in Australia (see the links section); they provided flowers in yellow, white, pink, red and violet. I thought I'd post these picture because I'm interested to know what readers think about the effect. 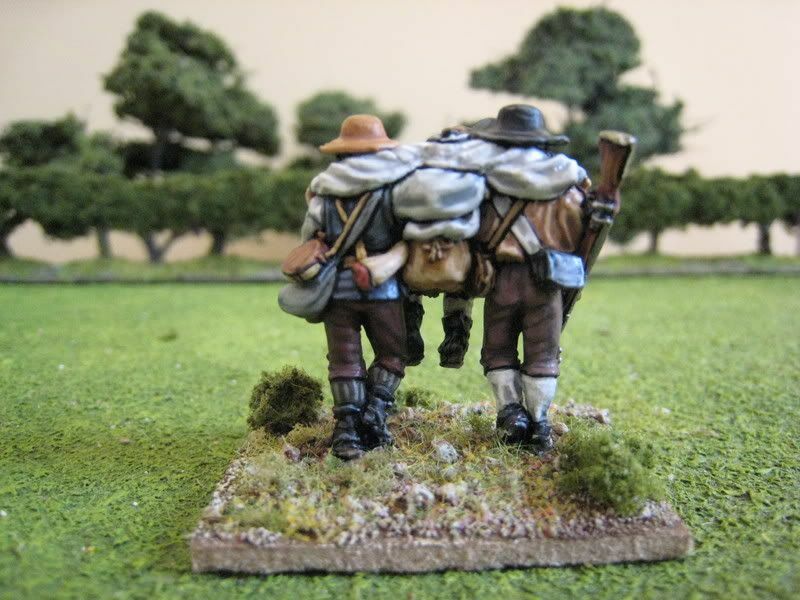 I have already posted one of these pics elsewhere and opinion seems to be mixed, with some clearly feelign that this sort of basing material detracts from the military look of the figures ("Flowers, Sir!? Flowers!!!" was Dave Brown's response). 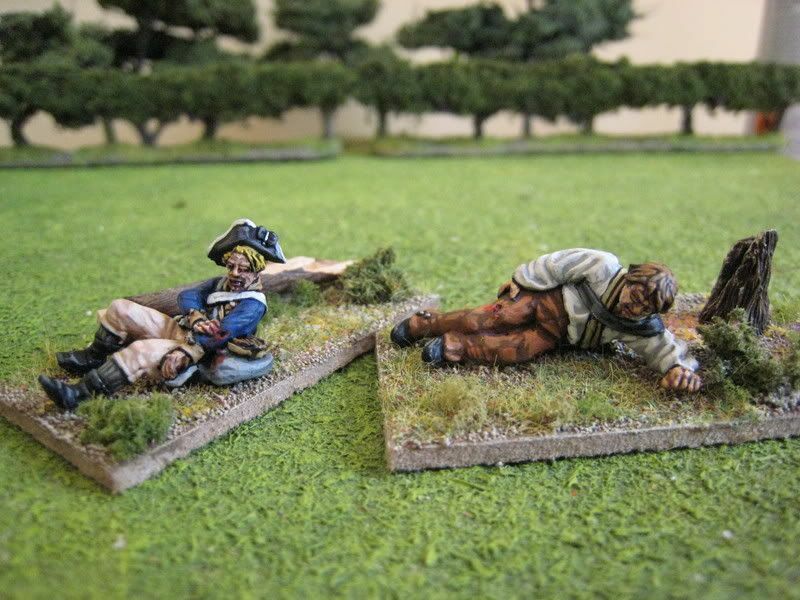 The fallen chap with the pistol has rather too much red scatter on his base - a couple of people who have seen this pic assumed it was blood! (Someone else pointed out that if the red scatter is suppoed to represent poppies, then due to the stalks the red flowers should properly be at chest height.) The scatter is more subtle on the other bases, so much so that you can't really see it in the photos, although an examination up close will show little specks of yellow and pink. I'm still experimenting, but I would be interested to know what people think of the use of this sort of material generally. 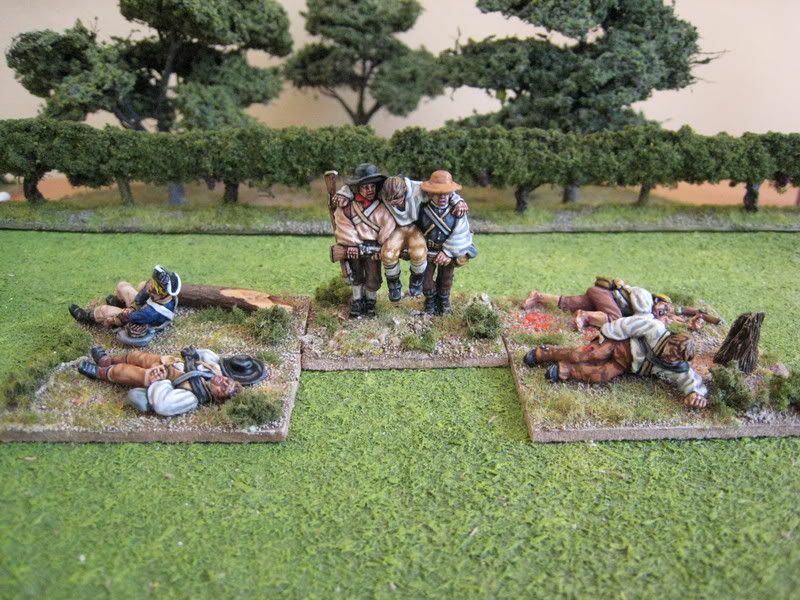 All the figures bar one are from the new Perry southern militia casualties pack; the figure in the uniform coat if from the Continental casualties pack. 7 figures. Painted May 2008. 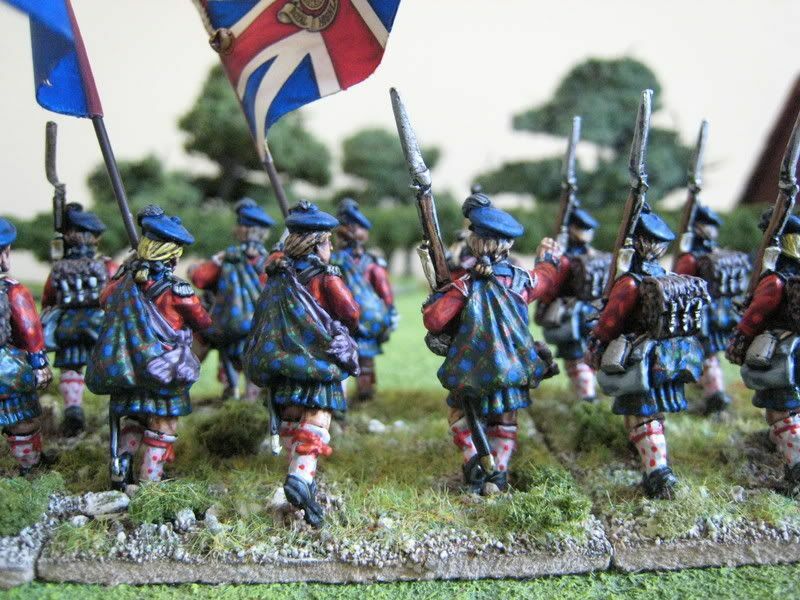 The Royal Highland Emigrants were recruited largely from ex-soldiers who had settled in Canada and Newfoundland, although recruits came from all over the northern colonies. As an aid to recruitment, General Thomas Gage stipulated that the soldiers would wear highland dress in the manner of the Black Watch. Men joined in sufficient numbers for two battalions to be formed. The regiment was taken on to the British regular establishment at the 84th Foot in January 1779. The first battalion operated mainly in Canada, whilst the second battalion was engaged in the Carolinas and elsewhere in the south. 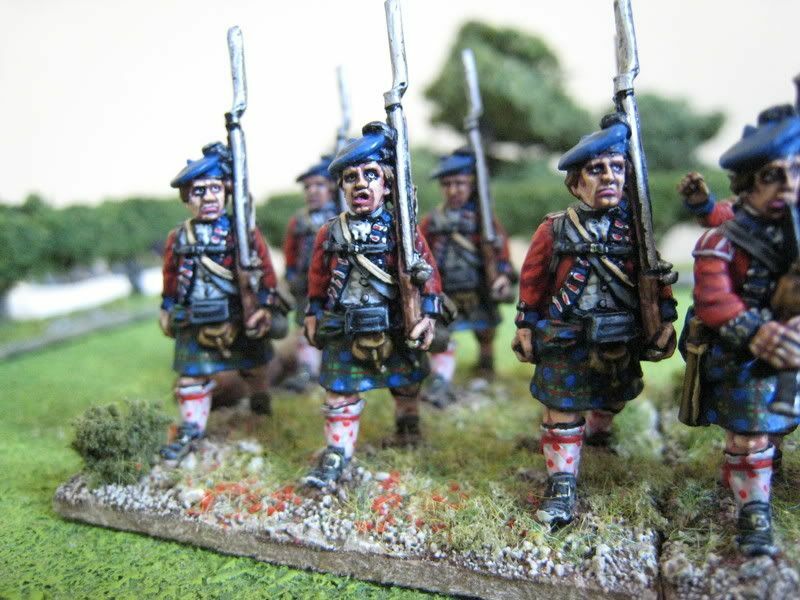 I have had these figures for a good few years and could not think of how to use them given that I painted up the Black Watch in full plaid and then the 71st Foot in overalls. 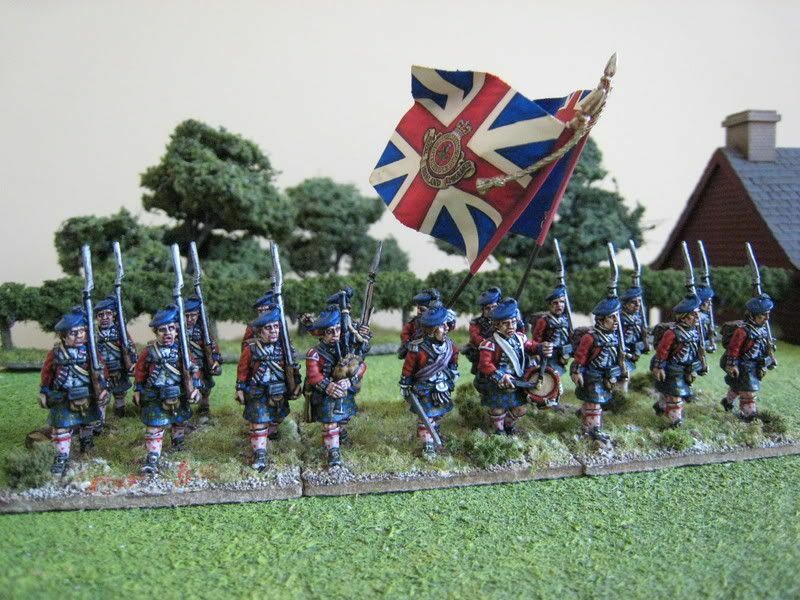 I had always assumed that to convert the Black Watch into the 84th Foot one simply needed a spare command stand with the regimental flags - after all, the uniforms are essentially the same. In any event, I had not come across any decent battles in which the 84th participated. So the figures languished in my bits box for a good while. 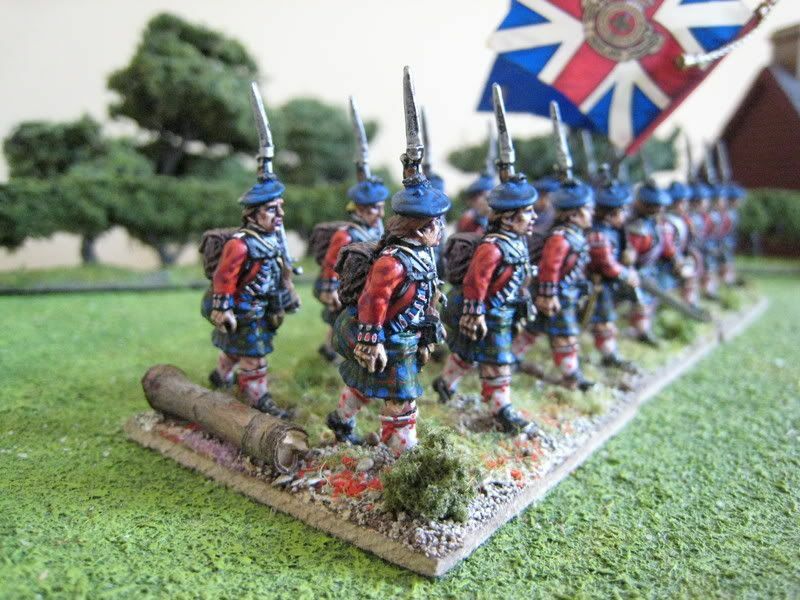 I dug them out when I bought the second "British Grenadier!" as it features the 84th at Eutaw Springs. The scenario gives you the option of combining elements of this and another regiment into an 18-figure unit, so I decided this would give me the opportunity to field the 84th at full 18-figure strength. So this unit is designed to be the second battalion, which means that the flags should have a "golden wavy" in the top left hand corners. Also, one queries whether the troops would have retained their plaid in the southern campaigns, probably switching to trews or brown trousers. But those "mistakes" aside, I'm quite happy with the way these figures turned out. There are a couple of subtle differences in the uniform as compared to the Black Watch. 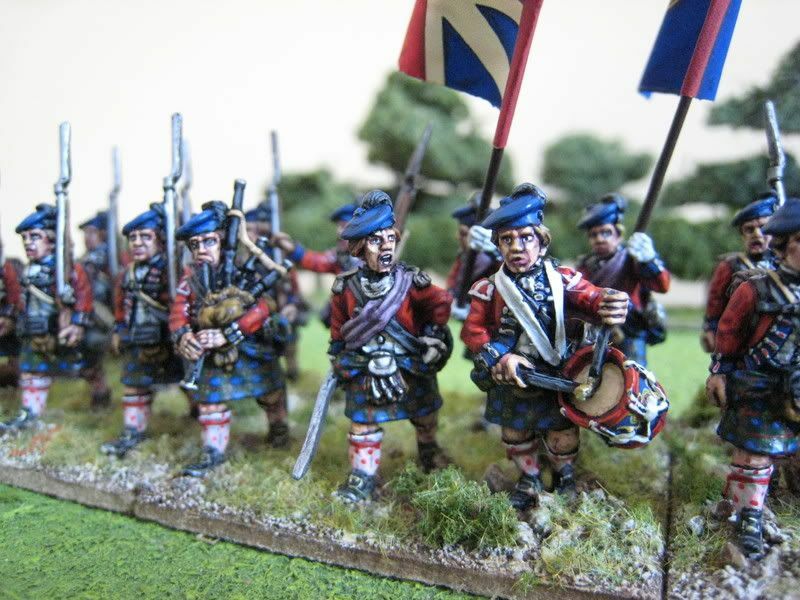 First, I gave the government sett tartan a red stripe rather than a black one; that followed information in the Osprey on "18th Century Highlanders". Secondly, the lace seemed more red than blue and so I painted it by placing a small red dot on a white background, whereas with the Black Watch the dot is royal blue. Thirdly, I remembered to paint the lace of the musicians in yellow and blue, which I forgot to do with the 42nd. The design on the front of the drum is obviously different, but those are, I think, the main changes in uniform. 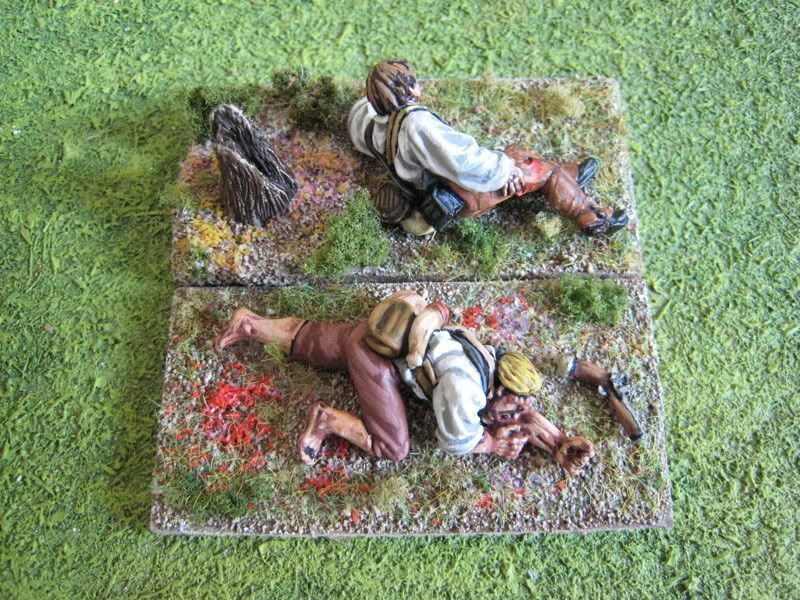 When I based these figures last night I felt inspired to tart up the bases a little, and so I added a fallen log and some red and purple flowers (courtesy of Murray Bridge Trees & Terrain - I will post more on this in a couple of days). I did a step-by-step on the tartan here. On a point of collection trivia, I see that this regiment takes the tally of British regular battalions in my collection to 25. 18 figures. Painted March/April 2008. Flags by GMB.